As clients and audiences start demanding 4K at events, your current HD sources and displays shouldn’t become obsolete – and the V-600UHD lets you transition to 4K workflows as demand and budgets allow. 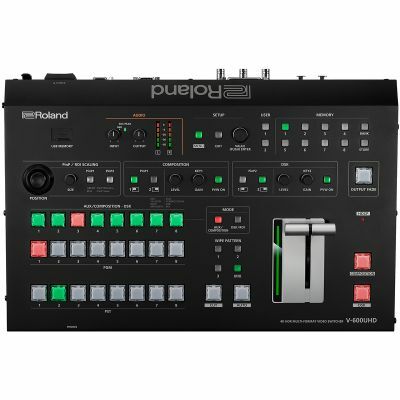 With Roland’s Ultra Scaler technology, scaling is provided on every input, so you can use Full HD and 4K sources simultaneously, and output at multiple resolutions. You can also leverage the high pixel density of 4K camera sources in Full HD workflows for problem-free, visually-impressive productions. Upgrading to 4K greatly improves the image quality in your productions, so why compromise with switchers that may deliver more pixels but omit the true capabilities of 4K? The V-600UHD uses High Dynamic Range [HDR] so your events look amazing. You don’t just see more pixels, you see better, more dynamic-looking pixels that preserve the details in the darkest and brightest areas of an image. HDR provides well-balanced stage lighting without oversaturation for IMAG (and it’s easier to achieve compared with using SDR.) And SDR dynamic range signals can also be input and switched with the V-600UHD. With full 60Hz framerate support, the V-600UHD delivers a smooth, crisp video image without the blur that’s common when fast motion is displayed at 30Hz refresh rates. The V-600UHD supports BT.2020, the highest-specification Wide Color Gamut (WCG), as well as RGB and BT.709 standards to display the widest range of visible colors. This provides an increased level of realism and improved color accuracy, especially for red and yellow color ranges. Internal 10-bit Color Depth processing reduces color banding and sharpens high-detail sources from computers. This makes it easier to read small fonts and other fine details, even when drastically scaled and magnified. Not all 4K content has the same aspect ratio. Although 4K content is always 2160 pixels high, DCI or “Cinema 4K” is 4096 pixels wide, which is 256 pixels wider than UHD. The V-600UHD lets you switch and display content at the originally intended aspect ratio, without cropping or letterboxing. The V-600UHD has four HMDI 2.0 and two 12G SDI inputs, perfect for events needing several computer and video playback sources complete with IMAG camera support. Each input independently supports input and scaling of HD, Full HD, UHD 4K, and DCI 4K, as well as PC resolutions from UXGA to DCI 4K – with no converters needed. AUX destination switching makes it easy to include down-stage confidence monitors, while the configurable multi-view monitor lets you see all your sources, programs and previews – at a glance. Each output also supports downscaling to Full HD for outputting to streaming encoders or other HD-equipped destination displays. You don’t need multiple cameras for multiple shots. If your production requires a wide shot of the stage, a medium shot of the speaking panel, and close-ups of each speaker, the V-600UHD has you covered with built-in Region of Interest [ROI]. This allows you to point a single 4K camera at the stage and use the V-600UHD’s input sharing and scaling functions to crop out up to eight “camera shots” that you can assign to the V-600UHD’s cross points. Increase your production value without increasing your camera count, complexity or costs. The V-600UHD supports two Picture-in-Picture windows (PnP) that offer so much more than simple fixed inset windows. You can accomplish results comparable to dedicated screen processors, with fully customizable aspect ratios, sizes and input source scaling – letting you display whatever you want, wherever you want it. Combine flexible PnP with the ultra-wide pixel count of DCI 4K to create engaging and impressive screen sets. Embedded audio from digital video signals can be tricky to incorporate into audio systems at an event or performance. Superior audio management lies at the heart of the V-600UHD, with flexible 24-bit 48kHz audio processing that lets you avoid problems before they occur. You can de-embed audio from the currently selected source and send to an external sound mixer using Audio Follows Video. Or program audio returning from the same console can also be embedded in one or all video outputs and then sent to the web, a recorder or overflow room. LED display technology has quickly become a versatile creative tool for event designers, whether serving as the background for a stage or a huge backdrop at a music festival. The challenge is that when using IMAG cameras with a bright LED background and an SDR switcher, it’s difficult to light a presenter or performer when standing in front of the LED – they just appear as a shadowy outline. But now you can easily work with low light stages and bright backgrounds; just use an HDR camera with the V-600UHD and the subject appears properly lit. Corporate events and festivals use pixel widths that exceed the HD format’s 1920 pixels. With the V-600UHD’s support for DCI Cinema 4K Resolution, you can switch content to display images up to 4096 pixels wide, fulfilling the creative vision of ambitious event designers. The V-600UHD offers incredibly high-quality “dot-by-dot” output scaling that allows you to directly connect to an LED display controller at the exact pixel dimensions, without the extra expense and increased latency of a dedicated scaling processor.